When a presidential campaign starts you can usually tell, and not only from official declarations. The French presidential campaign started last Wednesday night when President Nicolas Sarkozy officially announced his candidacy on the national TV network TF1. But it took less than a week for the campaign to become a heated heated battle online. During the last week Twitter suspended a few accounts that parodied Sarkozy’s official account, launched on Feb. 15, and of his campaign slogan, “La France forte.” One account was later reinstated. A screenshot of one of the fake accounts before the suspension: the latest tweet says “François Hollande should eat less greasy food, his hands are so sticky"
This decision raised many protests, especially on Twitter where people used the hashtag #SarkoCensure (which has been a trending topic since Sunday). The suspension has also been defined as “political censorship” by Internet freedom organization Internet sans frontieres. During the past few days, the campaign team of Sarkozy’s main opponent, Socialist Party candidate François Hollande, had protested against Twitter's decision, too, accusing Sarkozy’s campaign of reporting the accounts — and using his influence to get a result. The Hollande campaign also launched a petition to ask Twitter for more transparency and explanation on the story: "This suspension decision is already not very understandable in the case of a parody account, as this case is explicitly permitted by the Twitter TOS. But it becomes inexplicable, when it strikes an account that can not possibly be suspected of impersonating a real individual, and that merely disseminates a political message. This decision becomes questionable when we see that other similar accounts against François Hollande continue to operate normally" the letter says. The Hollande campaign lamented in fact that Twitter didn’t give the same treatment to accounts that were explicit parody of their candidate, like @FrancoisHolland (run by Kaboul.fr, too) or @Flamby2012. When contacted by email, Twitter representatives said they can't comment on individual accounts or suspensions for privacy reasons. Citing Twitter’s policy on parody accounts, Rachel Bremer also added that even though accounts may be suspended in the same general timeframe as some other public dust-up, it doesn’t necessarily mean they were suspended for the same reason. This was not the first allegation of online political malpractice in the French presidential election. On Feb. 14, the French magazine L’Express published the result of an investigation, claiming that Sarkozy's campaign staff was informally assisted by Facebook representatives while setting up the Facebook Timeline of the candidate, which has been online since mid-December. According to L’Express’ Frederic Martel, citing internal sources at Facebook, Sarkozy’s campaign team was allegedly approached in September, about the same time of the Timeline’s official announcement. 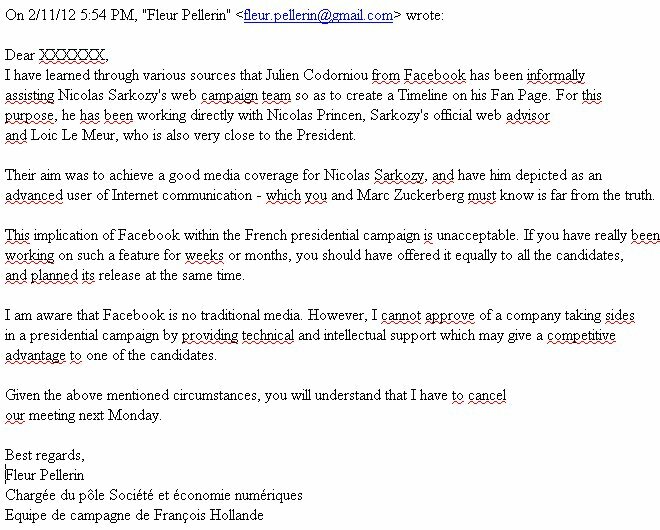 François Hollande's team, L'Express reports, was only contacted by Facebook in December, an alleged dichotomy that earned Facebook an angry letter from Fleur Pellerin, Hollande’s digital policy advisor, which was published by L’Express. Sarkozy's UMP party and his campaign use an external agency called Emakina for digital strategy, L'Express reported. Being part of Facebook’s Preferred Developer Consultant program, Emakina would have special access to new Facebook features. This is not the first time that Zuckerberg's company has been accused of political favoritism: back in 2007, TechPresident’s Micah Sifry and then Associate Editor Josh Levy pointed out that when the company rolled out Facebook Platform, the Obama campaign was the only candidate to have an application already built. At that time, they noted, Facebook co-founder Chris Hughes was working on the Obama campaign. In this latest case, Facebook representatives in France denied the allegation of special treatment (as the Obama campaign did in 2007). A Facebook spokesman did not respond to a request for comments.